Whenever I make a simple recipe that’s extremely flavorful and diverse in flavor and texture, I’m always wowed. This recipe is one of those veggie noodle dishes that you’ll make and go, “Wow! 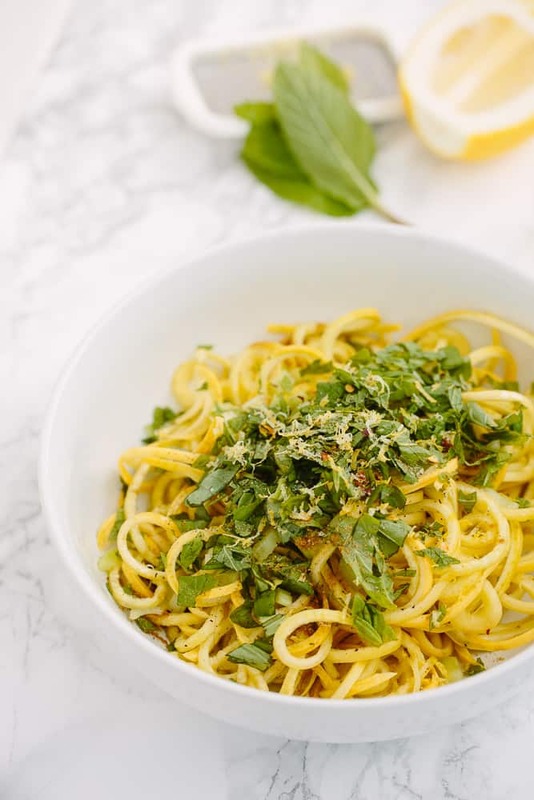 Spiralizing is truly amazing.” The simple use of yellow summer squash with fresh herbs (mint and basil), a dash of cumin, olive oil, lemon juice and a couple other seasonings is powerful. I’m really loving this recipe from my friend Amie. If you don’t know her, check out her gluten-free blog The Healthy Apple, which not only offers healthy recipes, but also, a forum for those who have struggled with autoimmune issues and have turned to the ultimate medicine: food. Her story is incredible, she absolutely healed her body (despite the discouragement from her doctor’s) through food. 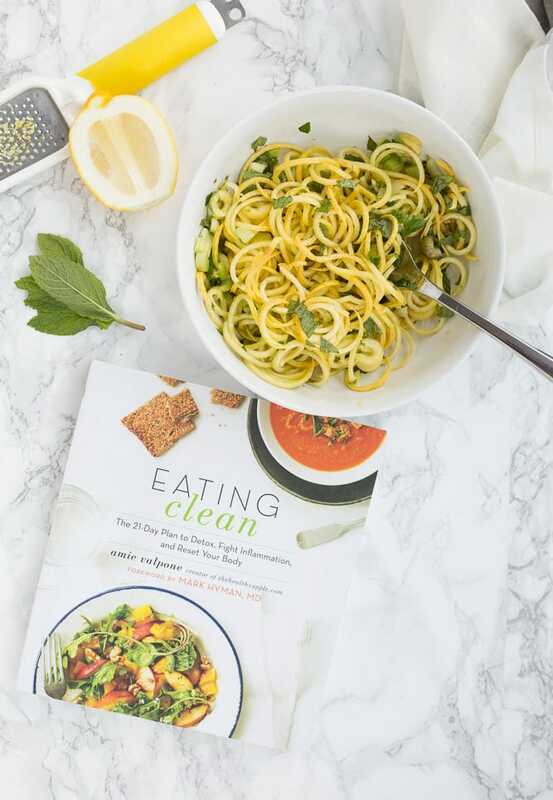 This book even has a foreword by Mark Hyman, the famed physician and scholar who sheds a lot of light on healthy eating. I’m happy to support a fellow food blogger, friend, and woman today on the blog! I really recommend her book, especially if you have experienced bodily issues related to things like inflammation. She sheds a lot of light on it all and her recipes are easy and approachable! If you’re just looking for a great pasta dish or a fun summery side dish for potlucks, this noodle dish is perfect! It’s colorful, tasty, and comes together quickly – it even saves well in the refrigerator! And, you can definitely substitute green squash in there, if that’s all you have. This recipe looks amazing! Just when I saw the photo, I thought, "Summer!" And I love anything that keeps well in the fridge for leftovers. Heh. How do I detox? Water is my simplest way. Every few mornings, I will go the Apple Cider Vinegar route; I'll add 2 tablespoons of ACV (with "the mother') to 16 ounces of room temperature water, sometimes with a teaspoon of raw honey. It's got a tart kombucha kinda vibe to it. I dig it. Haha! This is a great change from my favorite zucchini but another great authority on foods, auto-immune disease and nutrition is Dr. William Davis and his books on wheat belly who started off the healthy eating to prevent and cure auto-immune disease. The number of peopole who show improvement and visual changes in as little as 3-5 days is unbelievable. He has a blog with great wheat, cereal and grain-free recipes called wheatbelly.com because there's more to this than just being gluten-free for many, many people as the newest research shows. I just started Whole30, and this recipe is PERFECT for me! Thanks Ali! I've been on the whole30 and today is my last day! I loved healing my body naturally through foods! So excited for Amy, Congrats! Instead of thinking of it as "detoxing" I make detoxing practices just a part of my lifestyle. I love drybrushing, epson salt baths, warm water with lemon, and oil pulling if I'm feeling ambitious! I have been waiting for her book! HEr story is great. my favorite way to detox is drinking half a lemon in warm water with some apple cider vinegar and cinnamon in the morning and before dinner each day. This loks so simple yet so gorgeous! Thank you for this discovery, I didn't know Amie's blog. Her story is really impressive, and can't wait to get her book! Such a pity the giveaway is, again, open only to US residents. Love to spiralize! All these recipes are so fun to try. I haven't detoxed before but I did start eating formy bloodvtype this year, so I have given up a lot of foods and drinks that are not compatible with my blood type. I have detoxed in a way by giving up coffee and flavored creamer and replaced it with green tea. This looks delicious!! I detox by adding lemon to my water and drinking much more of it. I also like to eat a lot of greens. this recipe looks so fresh and easy!! can't wait to try!! thank you!! Eating at least 5 vegetables and 3 fruits per day, as well as excluding animal products always makes me feel my best! And spiralizing is such a great way of cooking that helps to achieve those dietary goals! I detox by making sure I eat as clean as possible for the week! For me, that's following a couple days of the whole30 plan, avoiding alcohol and drinking lots of water and kombucha! Detoxing as we speak and this recipe will be a great back-to-whole food start! I detox by exercising, going for a walk, or eating clean. This recipe looks delicious!! I detox by trying to drink lots of water and avoid alcohol. Always makes me feel better! I love this post/recipe; it really speaks to my journey to eat clean and healthy. One of things I've struggled with is to not overuse sides/toppings, and to rely more on the use of herbs, spices and oils. Thank you for sharing and for opening up this giveaway! I take detox baths, stop eating all grains, dairy, and sugar. I'm always gluten free, but I slip on the others sometimes. This sounds light and refreshing after this cold winter! I detox by upping my water intake, decreasing my stress, and eating all the veggies! I love to start a day with water, lemon and cayenne! Then a green juice for breakfast, always helps to start my day off right especially if I had one too many drinks the night before! This recipe looks awesome! 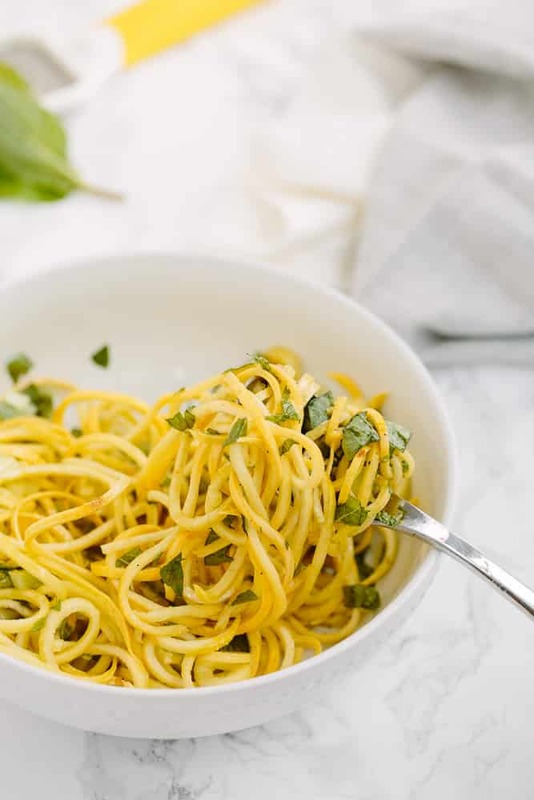 I noticed this in your recipe: Ingredients •3 large yellow summer squash, cut into thin strands with a vegetable peeler or spiral slicer (spiralizer) or julienned. Can you spiralize yellow squash with the spiralizer? Every morning, as soon as I wake up, I squeeze one whole lemon or lime in 1 cup of filtered water, wait 10 minutes and then drink one cup of just plain filtered water. A great way to start the day and detox and get the body systems to wake up. I read somewhere that it takes 20 minutes for water to go through your system. I only drink 1 cup with lemon first because I want the lemon water to be more concentrated. I detox with lemon water and big salads! I try to ensure I am getting all my water! Sometimes slacking on that can really make a difference. I cut out sugar and processed foods- it's amazing how much better it makes me feel! How do I detox? Eating a lot of veggies of all different colors! Eating less sugar and less white flour, put keeping up with healthy grains. I detox by getting a good sweat in and cutting out sugar. I always feel refreshed after doing so. detox with juice, giada detox soup, and green smoothies! I have never felt the need to detox. Maybe I should rethink? I do drink lots of water and I eat lots of fresh fruits and veggies and virtually no processed foods. Question about this recipe: I realize you use the WW recipe builder, but the only ingredient that would seem to have points is the olive oil. It calls for 2 teaspoons, which is actually a little less than a tablespoon, which equals 4 points. Even if you do figure 4 points for the oil, at 2 servings, wouldn't that be just 2 points per serving? I drink tons of water and increase my fresh fruits and veggies. I detox by eating clean and drinking lots of water. Spiralizing is a perfect way to incorporate clean eating into your diet. I use juice and drink lots of water to detox! Looks like a plate of summer! Trying to eat fresh and organic wherever I can. Can't wait for farmers markets and organic CSA to get up and running. What a fresh and delicious recipe for Spring! Thank you so much for sharing and caring! Can't say I've ever "detoxed". I do drink a lot of water and eat lots of veggies though. I detox by limiting alcohol and sugar, and eating tons of fresh greens. I did the whole 30 this year and loved it. Now it's mostly staying off of sugar and gluten. I use clay. My doc says it detoxes heavy metals. Best way to detox is to get enough sleep and drink enough water. I detox by drinking water and green tea! I tend to juice more greens when I need to detox and drink lots of bone broth, yum! I will also take milk thistle supplements to help detox the liver. Can't wait to check out Amie's book! Thanks for all you share! I usually do a Whole30 to detox. I'm actually going to start one again in April! This looks perfect for my daughter that has a lot of stomach problems. She is on a very restricted diet. Yellow squash is my favorite! I recently came off a very low carb diet and noticed that introducing complex carbs back into my body isn't settling well with my belly. I'd love to read more about this! Thanks! Best way to "detox " is by cutting out processed food and refined sugars! :) eat real, whole food! Green smoothies and lots of tea! I don't really detox, but I am trying to eat in a healthier way each day. Drink plenty of water (that and herbal tea), and eat more vegetables. I have felt so much better since I have made my lifestyle more plant-based. And I wish I had read this recipe before I went to the market. I want to try this! Sounds delicious! Just recently started to be more minded to healthier eating... learning to eat more fresh whole/raw food, more veggies and lots of water! I can't wait to make this recipe! While gluten-free is a good start, read the "Wheat Belly" books by William Davis explains why that is just the start. There's a LOT of new research over the last 10 years about sugars and the resulting glycation of blood cells and how that is attributed to the whole wheat product and not just the gluten factor leading to leaky gut and the concomitant litany of auto-immune responses thereto. Glad you're getting on the mend. I did it almost 3 years ago. I've been spiralizing with increased intensity for 3 years but started 20 years ago. Now if a veggie is in my kitchen, it's in for a good spiralizing! I have had the spiralizer for a year. I too have had problems with my thyroid. I have fluctuated from hypo to hyper to normal, heart palpitations, insomnia, constipation, ACNE since my early 30's. I'm 36 now. You name it and i had it. I changed my diet and Ali's cookbook has great recipes and I love this spiralizer, it's one of my favorites. But I also started plexus and it's like the change is tremendous! I'm thin and I don't want to disappear so I still eat my carbs like potatoes, rice. I'm trying to stay away from gluten but I must confess I still eat it occasionally. I was actually havin a problem with not building muscle and being skinny fat. Plexus changed that, ialways had a good diet just need that extra boost. Stress has caused my body tk more than anything, and yes i still have stress. Thanks Ali for great recipes and plexus for giving me my life back. If anyone wants to hear my journey or ask me questions feel free to email me. Please let me know if you're looking for a writer for your site. You have some really great posts and I feel I would be a good asset. If you ever want to take some of the load off, I'd absolutely love to write some content for your blog in exchange for a link back to mine. Please shoot me an email if interested. Thank you!